Now what could be easier than that? Today’s not the day for you. Then simply hit the link here…TurboCharged Sales and start the next step in your sales career. TurboCharged Sales is the ultimate rinse and repeat sales improvement program, designed for busy, ambitious B2B sales professionals who want to realise their full sales potential, and enjoy the financial rewards of their focussed sales efforts. How many times have you heard the following from someone in your sales team? Just how many times, and how often, have you heard this from your sales team? Want to see a spike in sales – get away from the desk and spend time with the team. Productivity and efficiency spikes? Get your sales leaders sat next to the mid-term players and see them move up the ranks. 20% ++ in some instances, and even better, it costs nothing. So why am I even bothering to write about this? When we coach, you and I, we’re building up influence. We’re transferring strong sales mental software that you and I have configured, with no bugs. The more you and I coach our team, the more we influence. The more we influence, the strong the mental software we install. Stop coaching and all sorts of bugs creep in. Someone else does…and those people don’t have YOUR business best interests at heart. Your sales team spends a lot of time with your customers. Your sales team may spend more time with your customers than they do with you. They want to please your customers. Your sales team, because of how they are wired, will derive great pleasure from doing this. They’ll even take flak from you, the business leader, if the customer is happy. Your customers have a huge sway and influence over your sales team. Your customers will let your sales team know what pleases them and how to get their business and leave it for the sales person to battle with the business. Your customers might even suggest strategies the sales person could use to get the sales manager to say yes…..
After all, haven’t we all had the sales person walk into our office with a deal that’s far better for the customer than it is for the business? That just means your customer has been a better coach to your sales person than you and I have…. Not one single business card has been exchanged, nor telephone call, email or Skype….nothing. Yet again, your customer and your competitor are coaching your sales team….back door coaching. Robbing you of sales and margin that are rightly yours. Again, if that’s a stronger coaching force than you or I then we can hang swinging…and deserve to. Your prospects are great negotiators. After all, your sales team are probably sat in front of the prospect because they want to kick and incumbent out? What’s that tell the prospect? Well, a savvy prospect knows there is a deal to be done. A savvy prospect will test how much the sales person wants the business. Typically they’ll test how much they want the business by claiming (and this is a rookie hole to fall into) that they love their current supplier and would only move if the price was much less…it’s all about the cheapest after all. So, your sales person walks through the door to the sales office with a signed order that costs you. We’ve all had sales people do this to us. You and I know the drill. But instead of wondering what the hell’s going on with the sales team…I’ll tell you. We’re not spending enough time with them. We’re not telling them the business reality. We’re not installing great sales software. We’re letting the bugs in. And that’s a really easy fix. Sales coaching is about influence. If you’re not influencing your sales team there will be a void and they’ll look for something/someone else to fill that void. 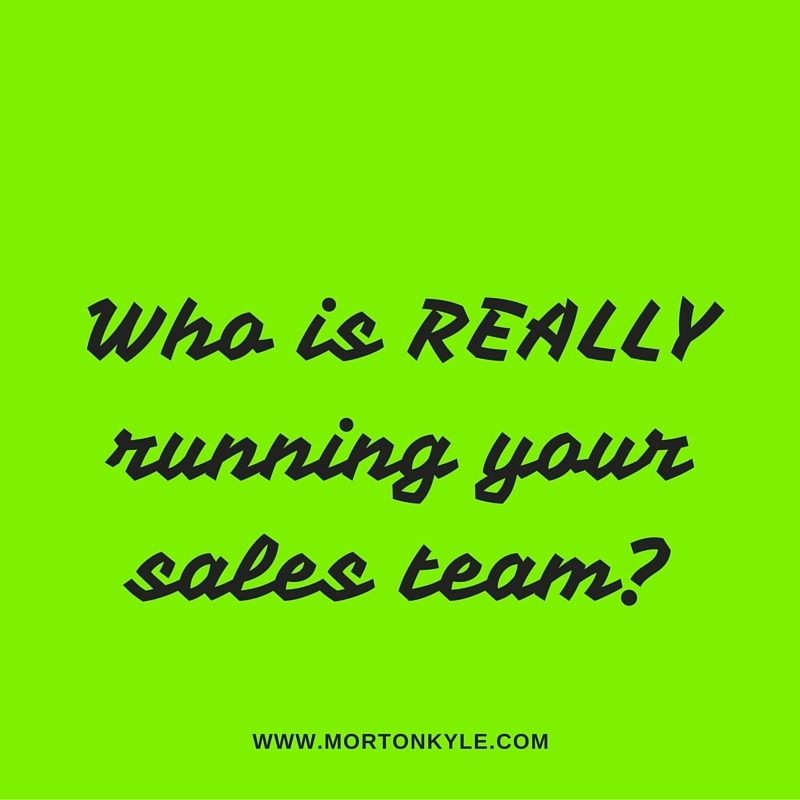 That something or someone could be the rest of the sales team, that can be good and bad, but usually bad. It could be anyone of the three dark forces above…and that’s really bad. It could be their friends and family who don’t really understand what they do… that’s usually bad too…you’ll know if you’ve ever had a meeting with a sales rep who wants a salary hike because their partner thinks they’re worth more than you’re paying them…very bad. Or you…and that’s usually good. 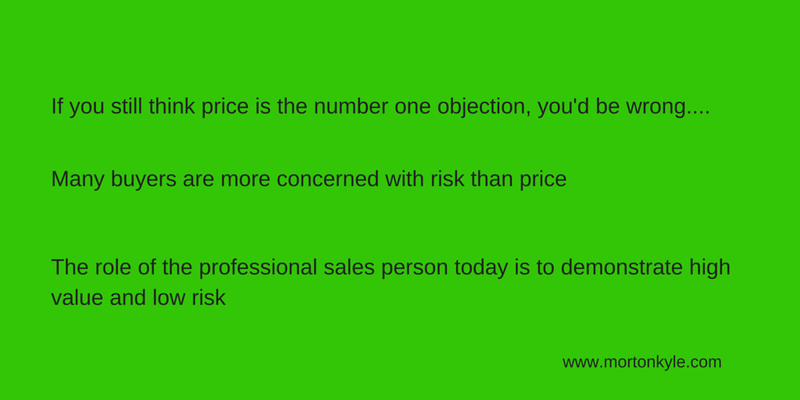 Price, Risk, Value….are you balancing all three for your buyers? Being unable to unpack and demonstrate risk and value will mean you’ll most likely need to drop your price….primarily to balance what the buyer will perceive as higher than actual risk and lower than imagined value. You and I always imagine things are worse than they actually are. Don’t let the buyer write your sales demo for you. Make sure you address their worse fears. Do that and the price comes a distant third on their list of needs to be satisfied. I spent most of last month doing sales audits…which is great. Firstly, because I love sales audits and secondly, because clients get some really profitable, quick and easy wins. But that aside, I’m always more than a little conscious that some of the time I’m having to bite my tongue. I’m keeping my lips firmly sealed because I don’t want to be accused of being TOO salesy, too aggressive, too over the top, just, well, too much. I’m sat in the middle of sales teams, full sales metrics in front of me and I’m wondering why the sales manager, the sales director and the CEO need me to tell them what’s happening and what needs to happen. BUT the most important thing I’ve realised is that HABIT will trump KNOWLEDGE every single time. And that’s where the rot sets in. 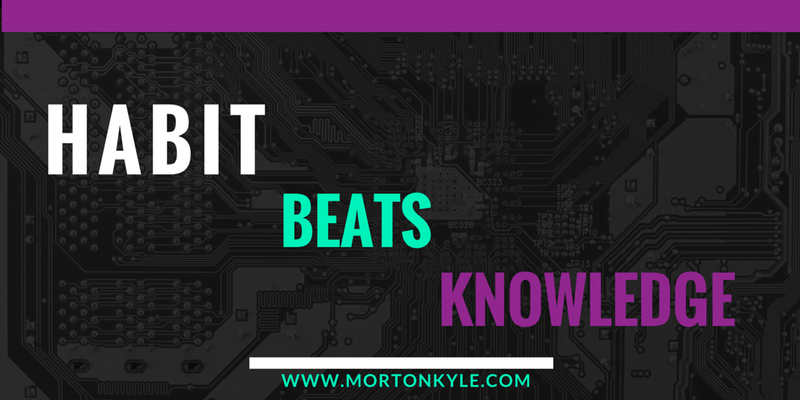 Sometimes the sales team or the business don’t need new knowledge, new skills or even new insights…that’s not appropriate in many cases…instead, it’s better I help them build better, more valuable, more rewarding and more results orientated habits. P.P.S. and if you feel you need a thorough sales refresher to refine, reprogram and reboot some of your best sales efforts and habits- hit this link – The Sales Improvement Workshop – Just £97 per person, PLUS, you enter a draw for 6 weeks 121 sales coaching…winner drawn on the day.